A 5-day special in-store registration for the Manila leg of PhilHealth Run in partnership with Toby’s and Runnr will kickstart on January 30 and will last until February 3. Select Toby’s (SM Manila, SM Fairview, EDSA Shangri-La) and Runnr outlets (Alabang Town Center, BHS, Trinoma) will accept all runners who wish to participate in the Manila leg of the inaugural PhilHealth Nationwide Run. Meanwhile, as an update to the initially publicized race information, Runnr ATC takes the place of Toby’s SM Southmall due to logistical limitations. All race registrants may claim their complete race packets at the Sports Loop, 3rd level of Robinson’s Galleria from February 2 to 11. Race participants can likewise register and claim their race kits in a one-stop race registration facility at the Sports Loop throughout the same period. PhilHealth Run Manila offers runners of varying capabilities four distance categories to choose from– 18K, 10K, 5K, and 3K. Corresponding race registration fees are P750, P650, P550, and P350. Roughly P6million or 85% of the proceeds of the race registration fees will be given to the Manila leg’s local beneficiaries – Philippine Children’s Medical Center and Cottolengo Filipino orphanage. It is with deep regret that we have to announce that the Battle of the Sexes race event which was originally scheduled to happen on Saturday, January 26, 2013 as a night-time race, is postponed. Despite being able to acquire approval/permits from the SM Mall of Asia and Pasay City authorities, we will be unable to organize a night-time scheduled race because we were not granted approval by the Philippine Reclamation Authority (PRA) who has jurisdiction on vital portions of the Battle of the Sexes race route. Citing safety and security concerns, the PRA have declined to provide approval on the use of the road under their authority/jurisdiction on a Saturday night race. With this being the case, RunRio in partnership with Hotel Sofitel will need to reschedule and redesign the said race as a Sunday-morning event, thus the need for postponement. The new schedule of the Battle of the Sexes race will be on Sunday, March 3 at 5:30AM. In line with the postponement, registration period will be extended until February 17 for Online Registration and until February 24 for In-Store Registration. Our apologies for this inconvenience and we look forward to seeing you at the rescheduled Battle of the Sexes event! 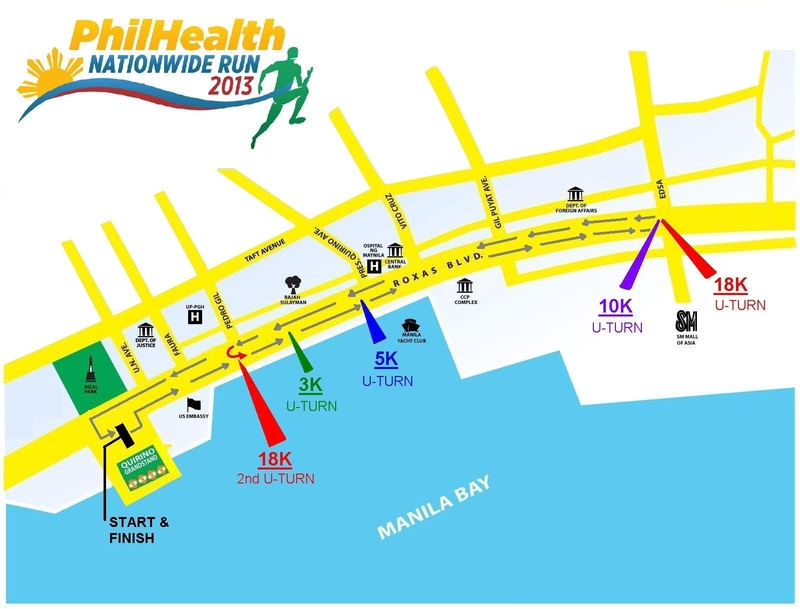 On February 17, 2013, roads in 18 sites across the nation will be taken over as the Philippine Health Insurance Corporation, better known as PhilHealth, stages the first simultaneous nationwide running event dubbed as PhilHealth Run 2013. Drawing inspiration from the two highly successful running events organized by its regional centers in Mindanao, the PhilHealth Run 2013: Nationwide Run for Mother and Child Protection promises to be a memorable sporting event as it aims to engage near 100,000 professional and amateur runners from different parts of the country – all running simultaneously with one aim in mind: Universal Health Care in the Philippines. Through this momentous event, PhilHealth aims to rally the entire nation as it helps stage a push towards bringing universal health care a reality. With universal coverage, every Filipino, regardless of status, is given the financial access and support to quality health care and services. The nationwide run on February 17, 2013 marks PhilHealth’s 18years of service to the Filipino people, having been established in 1995 with the enactment of Republic Act 7875. The event’s simultaneous staging across 18 sites in the country emphasizes the point of unity and oneness in aim and spirit. As PhilHealth’s 18th year anniversary celebration for February, dubbed National Health Insurance Month through Presidential Proclamation No. 1400 in 2007, it will surely stand different from the rest as one of historic and great proportions. In support of the country’s efforts towards achieving the Millenium Development Goals of reducing child mortality and improving maternal health, proceeds from the event will be used to support national and regional institutions promoting the protection of mothers and children in the country. The national beneficiary of the PhilHealth Run 2013 is the Philippine Children’s Medical Center, and local beneficiaries vary per region. More than just a running event, it endeavors to uphold the importance of our mother’sand children’s health in the challenge of nation-building. 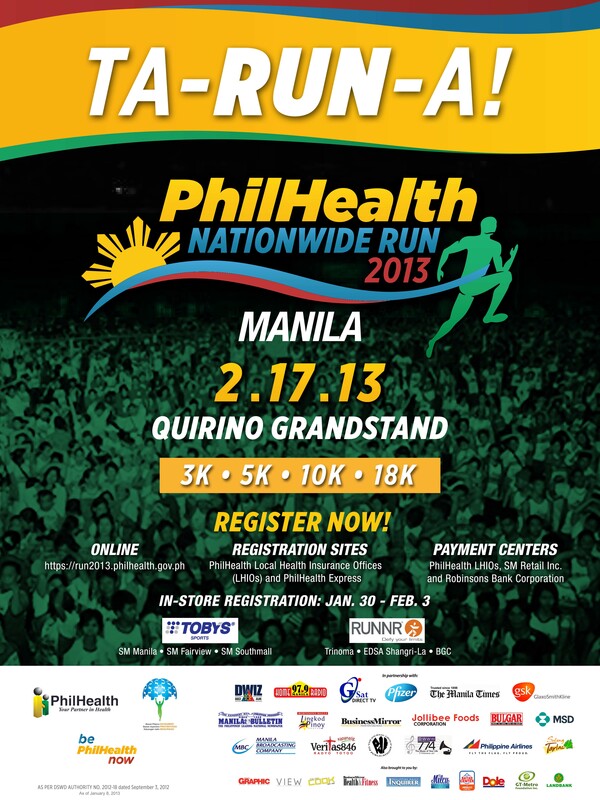 The Quirino Grandstand will be the site of the Manila leg of the country’s first simultaneous nationwide run – the PhilHealth Run 2013. On February 17, 2013, a whopping 18,000 runners from the country’s capitol will come together to celebrate and run for our nation’s mothers and children, and for universal health coverage in the country. Proceeds of the run will go to the benefit of the PhilHealth Run’s National Sponsor, the Philippine Children Medical Center, and the regional beneficiary, Cottolengo Filipino, a private non-stock, non-profit, religious, and non-government organization licensed and accredited by the Department of Social Welfare and Development (DSWD) that cares for abandoned, disabled persons, especially children. Contractubex: A Happy New Year Means a Happy New YOU! I believe in this product, I have used it for many years now. I use it for my CS scar and for my kid’s chickenpox scars and it has never disappointed me. It makes the scar less visible and has a cooling sensation on the skin. Are you all set for the New Year ahead? You may be prepped with your new planner, polka dotted-outfit and good luck charms to welcome 2013, but are you ready to face the coming year? We all have our own stories to tell, about mistakes we’ve made or accidents we’ve encountered – like a slip or an unintentional fall – that have resulted to a few unwanted scars. It’s time to leave 2012 behind. Scars are never a pleasant thing. Seeing a mark or flaw on your skin brings you back to the time you fell while wakeboarding in April, tripping on your heels during your birthday dinner in August, or accidentally burning yourself while baking a batch of homemade cookies in October. Some memories may be worth recalling, but any scar left behind is hardly a wanted souvenir. “2013 will be my year!” – Claim it. You can. No scar should keep you from turning a new leaf and making 2013 the best year of your life yet! The best way to do this is to let go of the past and leave it all in the year that was. Now you can, with Contractubex! Contractubex is a clinically proven treatment that combines the triple action of Cepae Extract, Heparin and Allantoin to help reduce the appearance of these unsightly marks on your skin. You may notice that there are several other scar treatments available in the market today. What makes Contractubex different from other scar treatments is that its ingredients help reduce inflammation and prevent excessive scar formation. Its water-soluble ointment base allows active ingredients to penetrate into deeper layers of the skin. Contractubex comes in a gel form that makes for its easy application on the skin. Just rub Contractubex on the affected area 3-4 times a day or as prescribed by your doctor. Results may be seen after at least 3 months of use so don’t lose hope when you don’t see results early on. Just follow the instructions carefully and be consistent in applying it on your scars. You’ll know that Contractubex is working when you notice a reduction in redness, relief of tension and less itching on the scar area. Contractubex works best on fresh scars, when the wound is completely closed. With Contractubex, you can finally move on from the scars of the past, and forward to a more confident, beautiful and happier you, just in time for the New Year ahead!